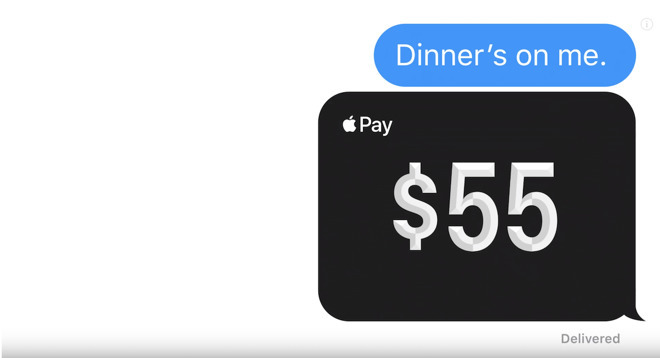 The ad starts with one person saying dinner is on them, and sending over $55 through Apple Pay Cash to their friend. The second person replies back that no, they've got it and shoots the $55 right back over. The pair then proceed to continuously send money back and forth as the ad speeds up and fades to a black screen that reads "Just text them the money." The "Apple Pay in Messages" tagline appears. As with previous commercials in the series, today's spot is predominantly silent, the only noise being the sound of iMessages being sent. Apple Pay has been gaining steam recently, performing well during Apple's most recent quarterly financial results as part of its "Services" category and winning top marks in Consumer Reports P2P mobile payment rankings. Later this year, Apple Pay will be expanding to Germany, as well as CVS and 7-11 in the U.S..